60% nuts. High fibre. Ingredients you can see & pronounce. Gluten and dairy free. No artificial colours, flavours or preservatives. 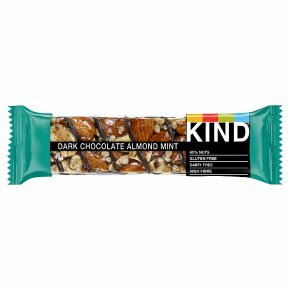 Kosher.Dark Chocolate Almond Mint includes almonds and cashews, sprinkled with peppermint leaves and paired with dark chocolate. Our Nuts & Spices bars have 40% less sugar per 100g than similar snack bars.